The Baluch and their lands hold the key to prosperity of the land locked Central Asian Region and Afghanistan. The British had divided Baluchistan in to three parts with Goldsmid Line and Durand Line in 1890s. The parts were allocated to Persia, British India and Afghanistan. Iran annexed Western Baluchistan in 1928 and Pakistan annexed British India portion in 1948. The Baluch therefore are aggrieved and demand independence. The Baluchistan of yore (Baluch Lands), had Afghanistan & Iranian provinces of Khorasan and Kerman in the North, the Arabian Sea & Indian Ocean in the South, Punjab & Indus River in the East, and the Strait of Hormuz & the Gulf of Oman in the West. Today it would have had direct access to the Strait of Hormuz and sit atop the busiest of SLOCs carrying 40% of world oil. Baluch lands have large untapped reserves of natural resources like uranium, silver, oil and gas. It provides land, air and sea connectivity to South Asia, Central Asia, and Middle East. It provides a very economical trade link for land locked Afghanistan and Central Asian Region. If united, Baluchistan would have an EEZ of 200 nm along its 1000-mile coastline. It is estimated that approximately 25 Million Baluchi are in Pakistan, 7 Million in Iran and about 3 Million in Afghanistan. Baluch Insurgency is on the rise in both Pakistan and Iran, though it is much more severe in Pakistan. Due to the geographical locations of Pakistan and Iran and the fact that both provide the shortest routes to Arabian Sea ports, has led both the countries to progress developing infrastructure and connectivity of their ports with Afghanistan and the Central Asian Region(CAR). Apart from oil and gas, the ports expect to harvest other trade commodities like cotton, which currently are routed through Russia to Middle East, East Asia and South Asia. Just over 100 km apart, Gwadar the Pakistani port and Chabahar the Iranian port are competitors for accessing the CAR markets. Both Iran and Pakistan are wooing Afghanistan by giving trade and fees incentives to favour their respective ports. Pakistan however fears that “Chabahar port would inflict a huge financial setback for Pakistan”[I]. This is as per a report by the Pakistan’s embassy in Dushanbe, to the Foreign Office in 2003. Both port cities, Gwadar (Pakistan) and Chabahar (Iran), lie on the erstwhile Baluch land. As per some estimates China’s maritime industries could contribute up to $1trillion by 2020. Chinese investments in Latin America and Africa are not only in energy sectors but span white goods, automobile parts and textiles amongst others, but the linkage with China is through the sea lanes. This coupled with inbound humungous requirements of oil from gulf and African countries has given rise to the Chinese fears about disruption of its imports and exports through choking of SLOCs due to state, non-state or natural factors. This has led to a rethink in the traditional maritime strategy of China, as per Ni Lexiong, “the ultimate drive to develop sea power is over sea trade”. The increase in sea trade implies its inherent protection by reducing vulnerabilities in the SLOCs of interest to China. Oil tankers from Gulf transit about 6000 nm and those from the African coast transit about 10,000 nm before they discharge their energy cargo at Chinese ports. Both the tanker routes have to pass through Malacca Straits in addition to problem zones in their respective routes. If tankers can unload at Gwadar, they would have to travel only about 680 nm from the Gulf and about 3000 nm from African coast (Angola). -Rail link up to Xinjiang by Dong Fang Electric Supply Corp.
-Construction of Kazakhstan-China and Turkmenistan – China pipe lines and their eventual augmentation by feed from Gwadar-Kashghar pipe line. If this project at Gwadar fructifies on expected lines it is estimated that whereas it would account for about 8% of the 2020 Chinese oil import requirements,[iv] the impact on outbound trade from China to Africa and Latin America would be phenomenal. The China-Pakistan Economic Corridor, CPEC is a 3,000-kilometer corridor from Kashgar in western China to Gwadar in Pakistan on the Arabian sea. It slices through the Himalayas, disputed territories, plains, and deserts to reach the ancient fishing port of Gwadar. Huge Chinese funded infrastructure projects, including road and railway networks as well as power plants, are being built along the way. Originally valued at $46 billion, the corridor is estimated at $62 billion today. The main thrust of these is to strengthen CPEC between the Pakistani port of Gwadar and the Chinese Xinjiang region. This also forms a part of the Chinese one belt one road, OBOR and maritime silk route, MSR programmes. Chinese government and banks like, Industrial and Commercial Bank of China Ltd and China Development Bank will provide funds to Chinese companies investing in the projects. The likely Chinese companies are China Power International Development Ltd, Three Gorges Corp, ICBC Corporation, Zonergy Corporation, and Huaneng Group. The Chinese president has however, linked the investments to the safety and security of Chinese assets and workers since the projects involving railways, pipelines, and roads will cross through the insurgency infested areas of Baluchistan. China would have berthing and transit support facilities for its warships and submarines at Gwadar. India has committed ~ $85 million to construct container and multi-purpose terminals at Chabahar[v]. Chabahar enjoys excellent weather and has direct access to Indian Ocean. It lies to south of Baluchistan in the Sistan province. Chabahar has two ports Shahid-Beheshti and Shahid-Kalantary and because of its vicinity to Persian Gulf and Oman Sea it has been a trade centre historically. It had proved its usefulness during Iran-Iraq war, as Iran was able to carry out its trade through this port safely since it lay outside Strait of Hormuz and the Gulf. A trilateral agreement was signed between Iran, India, and Afghanistan in 2003. India was to build a road, known as Route 606, connecting Delaram, the border city of Afghanistan to Zaranj the Capital of Nimruz province in Afghanistan. Iran was to build a highway from Chabahar up to Delaram. Border Roads Organization of India constructed the Delaram – Zaranj highway and it was completed in 2009. With easing sanctions on Iran, India has once again stepped in with a modest investment to construct container and multipurpose terminals; this would make Chabahar operational in future. It would also provide India with ease of trade with Central Asian Republics, Afghanistan and Iran. On 23 May 2016 during the visit of Mr Narendra Modi to Tehran, 12 agreements, including a deal to develop Iran’s Chabahar port were signed. India agreed to provide $500 million for the project, with a plan to invest an additional $16 billion in the Chabahar free trade zone. As far as Afghanistan is concerned, its natural resources include, 2.2 billion tons of iron ore, 60 million tons of copper, and 1.4 million tons of rare earth elements such as cerium, neodymium, and lanthanum. It also has lodes of gold, silver, aluminium, zinc, lithium and mercury. The carbonite deposits in Helmand province itself are valued at $89 billion. The US, Russia, China, India, Pakistan and Central Asian Republics have shown interest in these deposits. Afghanistan being a land locked country is currently dependent upon Pakistani ports for its international trade. If Chabahar port starts operating it would provide an alternate, better, and safer port to Afghanistan. The Chabahar port project is very important for Afghanistan since it would enable shipping goods to Middle East and Europe as well as allow inflow of key goods to Afghanistan. Economically it would imply a significant boost to its trade and investment in much needed infrastructure. Pakistan has also been eyeing the Chabahar port. In March this year, Pakistan and Iran discussed the possibility of better connectivity between Gwadar and Chabahar during talks between Pakistani Prime Minister Nawaz Sharif and Iranian President Rouhani in Islamabad[vi]. Iran, Afghanistan and Tajikistan had inked a trilateral agreement for the Anzob Tunnel project. Tehran provided $10 million grant for Tajikistan to complete the project. The tunnel, which is now operational, is providing safe and uninterrupted road access to Chabahar port from Tajikistan. Iran also extended $21 million credit to Tajikistan for developing its transportation and road sector. -India’s foray in to Chabahar is seen as a counter to China’s initiative at Gwadar and its linkages with CPEC. Transforming Chabahar into a major shipping port would be a win-win for all, i.e. Iran, Afghanistan and India. It will provide assured energy supplies, open trade for Central Asian Region and permit monitoring of SLOCS. It has opened up option for a sub-sea Oman-Iran-India oil pipeline. Further in case Turkmenistan-Afghanistan-Iran oil pipe line fructifies, Central Asia would be connected to India. This would be a game changer for the region. The Central Asian countries can reduce their dependence upon Russia and export energy to Europe and other Asian countries. Russia could also utilize this route for export of its natural resources and finished products. It would provide a cognizable counter to influence of China in the region. India would keep promoting Chabahar as a strategic port on the Makaran coast as it addresses both the ease of trading as well as India’s security needs in the region. -To China at Gwadar, Chabahar as and when it is fully developed would pose a significant challenge. It would provide a counter monitoring post to its activities and continue to sit astride the SLOCs threatening its energy security needs. The limited capacities of land pipelines to Xinjiang from Gwadar would still permit sizeable choking of oil flow through SLOCS to Chinese mainland by blockades along the route. Gwadar would be more beneficial to export goods from China to Africa and Middle East. Especially since China exports a large amount of armament to African countries and a land-sea route is far more economical then air freight to distant destinations. The focus of most researchers has been on energy imports by China through Gwadar, however, exports out of Gwadar would be far more profitable for China and provide an opening to a large land locked area of western China. -The US shares India’s concerns over Gwadar and the long-term threat it could pose to the SLOCs in the Arabian Sea. The US has supported the Chabahar Agreement cautiously for the time being due to thawing of relations with Iran. Increasing awareness in the US of Pakistan’s destabilizing designs in Afghanistan and leaning towards China, as also its support to terror groups on its soil is tilting opinion in favour of India. US would like a greater role for India in the reconstruction of Afghanistan and therefore it realises the importance of land/sea route linkages required by India to assist Afghanistan. -The development of both ports has provided impetus to the Baluch demand for independence. It has also enhanced the strategic importance of the Baluch land mass for Central Asian Countries, Gulf nations, Europe and African states. It is understood that Baluch would prefer US naval presence at Chabahar and Gwadar in case US supports the case for independence of Baluchistan[x]. Baluch are opposed to militarisation of Gwadar and Chabahar by China and Iran respectively. The Baluch stake their claim to both the ports since historically they are located on their land. India is progressing very cautiously at Chabahar since it supports demand for an independence of Baluchistan annexed by Pakistan in 1948. 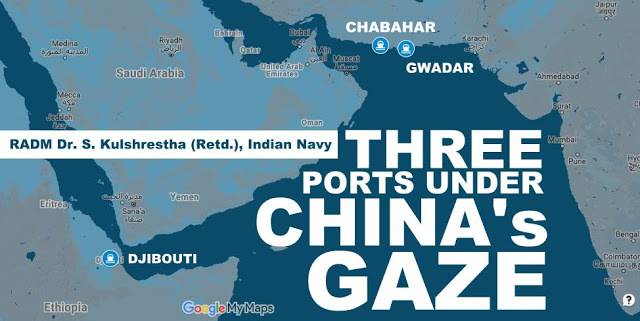 The ports of Gwadar and Chabahar lie 1565 miles and 1486 miles NE of Djibouti respectively where China has established its first ever overseas military base. The strategic significance of the Horn of Africa arises from Red Sea and oil. Red Sea is the shortest waterway between East and the west. The Arabian Peninsula and the Horn of Africa are separated by Bab-el Mandeb strait which is a critical choke point for flow of Gulf Oil. It forms a strategic link between the Indian Ocean and the Mediterranean Sea. Red Sea is connected with Gulf of Aden and Arabian Sea through this strait. Gulf oil exports which are routed through Suez Canal and SUMED (Suez-Mediterranean) pipe line pass through Bab-el-Mandeb. Closure of this strait would lead to severe delays in re-routing the supplies over much larger distances via southern tip of Africa. Eritrea, Djibouti, and Somalia lie on one side of the strait and Yemen on the other side, approximately 3.8 million barrels of crude passes through this strait daily. The area is piracy and militancy prone and poses a threat to oil shipping. Djibouti Naval Base– China’s support facility for PLA Navy at Djibouti; about 8 km from the US military base Camp Lemonnier; is its most ambitious and first of its kind foray in having a military base outside of China. The facility would have ship and helicopter maintenance facilities, weapon stores, and support infrastructure for a small contingent of PLAN personnel. This development is of prime importance for India in view of Djibouti’s vicinity to Chinese presence at Gwadar. The security of the Chinese base at Djibouti has been entrusted to the Western Theatre Command, WTC which has its headquarters at Chengdu in Sichuan province. It has the responsibility to look over India and Arabian Sea. It is the largest theatre command and has complex terrain including desert and high mountains, and long borders with India. In addition to the routine peacetime and wartime roles it has also been assigned a naval component to cater to the overseas base at Djibouti. The Tibet Military Command has been tasked for operations against India in the Arunachal Pradesh area, and training forces for high-altitude mountain warfare[xi] (The WTC headquarters includes a joint operations command centre also located in Chengdu). The WTC can deploy subordinate PLA Army, PLA Air Force and PLA Navy units, and if needed request additional forces from the CMC. China has replaced its Second Artillery Force by a new entity the PLA Rocket Force, which has been placed at par with the other three services. This fourth force would have both conventional and strategic missile components. The PLA Rocket Force would provide integral assets to each of the theatre commands. In addition, in a similar manner the PLA Strategic Support force would comprise the fifth arm of the Chinese military and will provide Intelligence, electronic warfare, cyber, and space operations support. It is understood that strategic missile assets including Naval components have been assigned to WTC for security of Djibouti. In addition to the military base at Djibouti, Bagamoyo port of Tanzania will be operated by China Merchant Holdings, Lamu port in Kenya is being developed by the China Communications Construction Company, and China Roads and Bridges Company is going to construct a modern port in Kisumu, Kenya (Lake Victoria). Related to the above is the ever-increasing export of Arms and Ammunition to African countries by China[xii]. Over the years China has established a weapon export relationship with several large and small African states like Egypt, Nigeria, Ethiopia, Zimbabwe, South Africa, the Republic of Congo, Ghana, Equatorial Guinea, Eritrea, Djibouti, Burundi, Ebola, South Sudan, Algeria, Cameroon, and Sierra Leone, among others. It is well known that Armament and ammunition shipments through land and ship routes are far more economical and safer than through Air and it makes sense for Chinese to route the increasing Armament exports through Gwadar to Djibouti over the sea and then beyond utilising as many friendly ports as feasible in Africa and the Gulf. On 27 June 2017, the Chinese contingent had participated in the 40th National day Parade of Djibouti along with other nations. On 11 July 2017, two PLAN warships, mobile landing platform MLP 868 Donghaidao and the amphibious transport dock Type 071 Jinggangshan set sail from the port of Zhanjiang to Djibouti. The ships were ferrying Chinese soldiers[xiii] for manning the Chinese military base at Djibouti. As per the agreement, the Chinese can position up to 10,000 soldiers at the base[xiv]. In June, this year a window of opportunity opened up for China since Qatar withdrew itself as a mediator between Eritrea and Djibouti land ownership dispute at Dumeira. Both Eritrea and Djibouti had backed Saudi Arabia and its allies in boycotting Qatar and it left no option for Qatar but to recuse itself. A dispute had arisen between Eritrea and Djibouti over Dumeira mountains and islands after the exit of France and Italy from Djibouti and Eritrea respectively. In June 2008, Djibouti claimed that Eritrean forces had entered the territory of Djibouti and had entrenched themselves. Both sides agreed to withdraw to pre2008 positions and have Qatar mediate the dispute after UN intervention in 2009[xv]. On 23 July 2017, the Chinese Ambassador to African Union, Kuang Weilin let it be known that China would consider mediating between Djibouti and Eritrea to resolve the dispute[xvi]and if requested China would also send troops to the border between the two countries. The Dragon has started stretching from Xinjiang-Gwadar to Djibouti and beyond in to Africa. [II] Ghazali, A.S. India Alarmed as Chinese Built Gwadar Port of Pakistan Becomes Operational.Countercurrents.org, February 8, 2008. http://www.countercurrents.org/ghazali080208.htm (accessed 10 Jul 2017). [iii] Kulshrestha, S. A Tale of Two Ports: Gwadar versus Chahbahar. World news report and Taza khabar news. 14 May 2015. https://worldnewsreport.in/a-tale-of-two-ports-gwadar-versus-chahbahar/ (accessed 10 Jul 2017). https://taazakhabarnews.com/a-tale-of-two-ports-gwadar-versus-chahbahar/ (accessed 10 Jul 2017). [iv] Corey S. Johnston, Transnational Pipelines and Naval Expansion: Examining China’s Oil Insecurities in The Indian Ocean. Naval Postgraduate School, Monterey, CA, June 2008. http://calhoun.nps.edu/bitstream/handle/10945/4124/08Jun_Johnston.pdf?sequence=1&isAllowed=y (accessed 10 Jul 2017). [v] Work at Chabahar Port in Iran progressing fast: Nitin Gadkari. Economic Times, 24 April 2017. http://economictimes.indiatimes.com/news/politics-and-nation/work-at-chabahar-port-in-iran-progressing-fast-nitin-gadkari/printarticle/58343356.cms (accessed 12 Jul 2017). [vi]Chabahar port will boost India’s connectivity with Afghanistan, Central Asia. Bussiness-Standard,21 May 2016. http://www.business-standard.com/article/news-ians/chabahar-port-will-boost-india-s-connectivity-with-afghanistan-central-asia-116052100485_1.html (accessed 16 Jul 2017). [vii] India, China, Japan Vying for Investment in Chabahar. Financial Tribune, 21 Jun 2017. https://financialtribune.com/articles/economy-domestic-economy/66869/india-china-japan-vying-for-investment-in-chabahar (accessed 16 Jul 2017). [x] Husseinbor, M H. Chabahar and Gwadar Agreements and Rivalry among Competitors in Baluchistan Region. Journal for Iranian Studies, Year 1, issue 1- Dec. 2016. https://arabiangcis.org/english/wp-content/uploads/sites/2/2017/05/Chabahar-and-Gwadar-Agreements-and-Rivalry-among-Competitors-in-Baluchistan-Region.pdf (accessed 19 Jul 2017). [xi] Jie, K. China raises Tibet Military Command’s power rank. Global Times, 13 May 2016. http://www.globaltimes.cn/content/982843.shtml (accessed 17 Jul 2017). [xii] Kulshrestha, S. Jade Necklace: Naval Dimension of Chinese Engagement with Coastal Nations Across the Oceans. 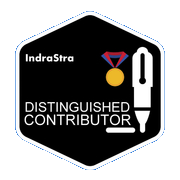 Indrastra Global,17 Dec 2016.
http://www.indrastra.com/2016/12/FEATURED-Jade-Necklace-Naval-Dimension-of-Chinese-Engagement-with-Coastal-Nations-Across-the-Oceans-002-12-2016-0032.html (accessed 17 Jul 2017). [xiii] Lendon, B and George, S. China sends troops to Djibouti, establishes first overseas military base. CNN,13 July 2017. http://edition.cnn.com/2017/07/12/asia/china-djibouti-military-base/index.html (accessed 25 July 2017). [xiv] China to open first overseas military base in Djibouti. Al Jazeera, 12 July 2017. http://www.aljazeera.com/news/2017/07/china-open-overseas-military-base-djibouti-170712135241977.html (accessed 25 Jul 2017). [xv] The United Nations Security Council Resolution 1862 dated 14 January 2009. [xvi]Rahman. A, Shaban. A. Eritrea-Djibouti border dispute: China opts to intervene. Africa News, 23 July 2017. http://www.africanews.com/2017/07/23/eritrea-djibouti-border-dispute-china-opts-to-intervene/ (accessed 27 Jul 2017).